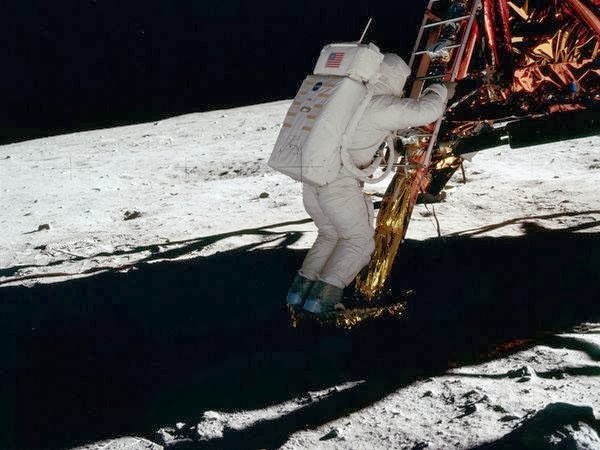 As an awesome demonstration of its newest graphics cards, Nvidia has put together a simulation to debunk longtime accusations that the 1969 moon landing was a hoax. For years conspiracy theorists have held that a careful analysis of the photographs and videos from the Apollo 11 lunar landing reveals that it must have been faked in a studio as part of a propaganda war against the rival Soviet space program. Theories cite clues like apparent multiple light sources, the lack of stars, and the flag waving in a vacuum. In order to demonstrate the power of its new Maxwell graphics cards, the engineers at Nvidia set out to simulate the landing as accurately as possible so that they could reproduce the famous picture of Buzz Aldrin descending to the lunar surface. Doubters have claimed that Aldrin is too well-lit in the capsule’s shadow, implying the presence of a light source other than the sun. Nvidia modeled the scene in Unreal Engine 4, focusing on the precise, reflective properties of the capsule, the lunar surface, and the astronauts’ suits. The Maxwell architecture allowed the engineers to simulate with unprecedented accuracy the reflections off of every surface in real time with global, voxel-based illumination. Even taking that into account, though, the image wasn’t quite right. Nvidia’s breakthrough came when they realized that Neil Armstrong taking the picture in his bright, white suit was exactly the missing reflector they needed to almost perfectly reproduce the fraught image. All of the accusations have been quite thoroughly debunked over the years (including by the master debunkers themselves, the Mythbusters), but as Nvidia’s Senior Director of Content Development, Mark Daly, points out in the video, it’s tough to prove a negative. This cool tech demo adds more weight to the side of believers, but of course you should feel free to remain skeptical. Just don’t mention it to Buzz Aldrin.